a vision or a mirage? Thailand's Kra Canal could cut up to 3,500km off shipping routes from the Indian Ocean to the Pacific as well as generate economic impetus in the neglected south. IN LATE 2017, I took a road trip through the rustic villages and rubber plantations of the Isthmus of Kra, the narrow, sleepy and relatively undeveloped strip of Southern Thailand that links the Malay Peninsula with the rest of mainland Southeast Asia. My assignment: to try and figure out whether the Thai government will allow construction of a mighty US$28 billion ship canal – 135 kilometres long and 450 metres wide – to link the Indian and Pacific Oceans and thereby change the economic and geopolitical face of Asia. This wasn’t the first time I had driven the route of the proposed Kra Canal. Twenty-four years ago, I had made the same grass-roots reporting trip. The resulting article I wrote in 1994 was frankly sceptical. Illustrated by a photo-shopped picture of a ship ploughing through a rice field, it posed the question: Is the canal a vision or a mirage? And privately I leaned to the latter view. Today, I am much less dismissive of its prospects. What’s more, I discovered, Chinese investors and researchers from prestigious Peking University have already begun quietly working in southern Thailand to survey the proposed route. If they have their way, the Kra Canal – or Klong Thai (Thai Canal) as it is known in the kingdom – will become possibly the most ambitious, transformational and strategically sensitive project in Chinese President Xi Jinping’s much-vaunted multi-billion-dollar “Belt and Road” and “21st Century Maritime Silk Road” infrastructure initiatives. Experts believe it could be built in five years. An Asian equivalent of the Suez or Panama canals, the Kra Canal would slice through the Malay Peninsula some 800km south of Bangkok and about 200km north of Thailand's border with Malaysia, linking the Gulf of Thailand and the Andaman Sea at roughly the same latitude as the resort island of Phuket. 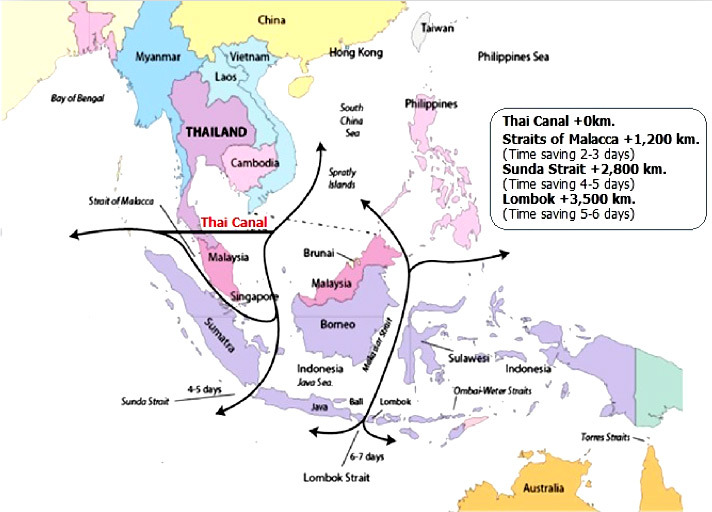 The canal's purpose would be to bypass the narrow, traffic-choked, piracy-prone and strategically sensitive Malacca Strait, the world's busiest trade route, which links China, Japan and other East Asian nations with the oil fields of the Middle East and major markets in Europe, Africa and India. The distance saved for ships passing between the Indian and Pacific Oceans would be between 1,200km and 3,500km, or two to six days sailing time, depending on routing. But perhaps more significantly, the canal would provide an alternative to a strait through which a record 84,000 vessels passed in 2016 – a figure that is rapidly approaching capacity – and which is already incapable of handling the world’s biggest vessels. As the region's largest economy, China would clearly be the biggest beneficiary of a Kra Canal. According to a 2017 report published by the Stockholm-based Institute for Security Policy, more than 30 percent of the world's seaborne trade and 80 percent of China's energy imports pass through the Malacca Strait, a choke point that Beijing fears could someday be blocked by the US or another rival power. The other major north Asian economies, Japan and Korea, would also stand to benefit, as would Sri Lanka and Vietnam, where new ports would be perfectly located to exploit shipping using the Kra Canal route. As for Thailand, the canal’s supporters led by former army chief of staff general Pongthep Tesprateep and former deputy prime minister Bhokin Balakula, believe the canal would have massive economic benefits, particularly raising living standards in Thailand’s south, where a secessionist insurgency in three predominantly Muslim provinces has long plagued the otherwise overwhelmingly Buddhist nation. According to supporters’ plans, the canal would become the heart of a special economic zone comprising new cities, ports, industrial estates, roads, tourism resorts and artificial islands constructed from excavated earth. Total investment would top US$50 billion and, once complete, the canal zone could provide as many as 2.5 million jobs in a region badly hit by tumbling rubber prices. For Thailand’s military junta, construction of the canal could help to revive an anaemic economic performance since it seized power in a coup almost four years ago. Although Thailand is Southeast Asia's second largest economy, its annual GDP growth is the slowest in the region. Another reason for the military establishment to favour construction is that it would enable the Royal Thai Navy to move its ships between the country’s east and west coasts without having to make the long trip south around the tip of the Malay peninsula. Construction of the canal, however, is far from a win-win for the region. As well as by-passing the Strait of Malacca, the canal would also by-pass Singapore, potentially syphoning off as much as 30 percent of the Lion City’s shipping business and threatening its dominance as the main regional trading and logistics hub. Political leaders in Singapore, from founding father Lee Kuan Yew down, for decades expressed fears about the impact of a Thai canal on their city state. To a lesser extent, ports in Malaysia and Indonesia could also be affected, further fuelling tensions within Asean. For India, there appear to be pros and cons. The canal could provide a faster and perhaps safer sea route for its trade with north and Southeast Asian countries. But a Chinese-funded and influenced canal would give Beijing further clout in what New Delhi sees as its back yard, the eponymous Indian Ocean. China has long pursued a so-called “string of pearls” strategy of building strategic ports and other facilities in places such as Pakistan, Myanmar and Sri Lanka to protect and expand its trade routes and economic and political influence through South and Southeast Asia. Adding to China’s attempts to secure sovereignty over the South China Sea by building fortified islands on reefs claimed by other countries, construction of the Kra Canal could further skew the regional strategic balance in China’s favour. Not even all Thais favour the canal. Some believe it will worsen the southern insurgency by physically dividing the country. Others dismiss it as impractical and think the money better spent on more urgently needed infrastructure such as rail lines and ports. These divisions were apparent at a recent debate hosted by the Foreign Correspondents’ Club of Thailand in which I was invited to take part and during which supporters and opponents vigorously pressed their respective cases. So how likely is it that the canal will be built? At first glance, history isn’t in its favour. First proposed 350 years ago by Thai royalty, the canal was stymied repeatedly by political, financial and technical obstacles. Although the Isthmus of Kra is just 45km wide at its narrowest point, the proposed canal route would have to be three times that distance to avoid inland mountain ranges. That would make the Kra Canal 58km longer than its counterpart in Panama. The relatively short 1,200km distance saved by bypassing the Malacca Strait also pales in comparison with the 11,000km saved by the construction of its Panama counterpart. That said, however, the Kra Canal would also attract vessels too big to pass through the Malacca Strait, which are presently forced to take much longer routes to and from East Asia via the Sunda or Lombok straits. Using the Kra Canal instead of the Lombok Strait would save 3,500km and six days' sailing time – a much bigger cost advantage. Two years ago the project became shrouded in confusion when two little-known companies from Thailand and China announced they had signed a memorandum of understanding to build it, only for their respective governments to deny that a deal had taken place. Then, last year, Prayuth stated emphatically that it wasn’t on his immediate agenda. "Those who want to initiate the Kra Canal have to push forward the project in the next government," he said last year. "I won't do it now because I have a pile of urgent work to finish." But if Prayuth’s 2014 coup put the lid on the political and societal divisions that so destabilised Thai society for the past decade, it hasn’t deterred the pro-canal lobby. Researching this story, I was able to confirm that some of the country's most influential figures are urging Prayuth to change his mind. They believe that if Prayuth can be persuaded to approve a feasibility study, a 450-metre wide, 26-metre deep canal capable of carrying the world’s biggest oil tankers, container ships and bulk carriers could be operational within five years. Funding would come in large part through China's infrastructure initiatives. Already, a group of retired generals has formed an organization called the Thai Canal Association for Study and Development, which has been working alongside researchers from Peking University and a Chinese company named Grand Dragon International Holdings to survey the proposed route. The generals even borrowed a helicopter from Thailand's Fourth Army to make an aerial reconnaissance. Meanwhile, on the ground, they launched a "hearts-and-minds" campaign to win the backing of villagers likely to be affected by the canal, collecting more than 100,000 signatures supporting its construction. "We hope the people will send a message to the government to pick up this project," General Pongthep, who chairs the Thai Canal Association and took part in the helicopter survey, told me. "It is a project that is very good for our country and the whole world, but until now has been left under the table gathering dust." Since retiring from active military duties in 2005, Pongthep, 72, has served as secretary-general of the General Prem Tinsulanonda Statesman Foundation, a charitable foundation set up by General Prem Tinsulanonda, a former prime minister who presides over the Privy Council, an elite body that advises Thailand's king. Pongthep, assisted by another retired general, former army Director-General of Civil Affairs Pradit Boonkerd, runs the canal association from the offices of the Prem foundation, although he said he is acting in a personal capacity and that neither Prem nor the foundation are directly involved. "We are retired officers, we have time, we are just like normal people," he told me. Even so, Pongthep and Pradit's fellow canal advocates include a who's who of Thai elder statesmen. Among their number: former Prime Minister Thanin Kraivichien, who in 2016 wrote an open letter to Prayuth in support of the canal, former Supreme Commander General Saiyud Kerdphol, and Admiral Supakorn Buranadilok, president of the Royal Thai Navy Advisory Group. Another high-powered pro-canal group is the Thai-Chinese Culture and Economy Association of Thailand, a Bangkok-based organization with close links to Beijing that is headed by former Thai deputy prime minister Bhokin. In recent speeches in China, Bhokin has called for the Kra Canal to be considered for inclusion in Beijing's Belt and Road initiative. Bhokin told me that Chinese officials have expressed support for the idea, but are waiting for Thailand to approve the canal formally. "They respect Thai sovereignty and do not want to force Thailand to accept Chinese ideas," he said. Still, they are lobbying hard. In September, Canal supporters staged an international conference in Bangkok co-sponsored by King Mongkut's Institute of Technology Ladkrabang, a leading Thai university. Speakers including influential Chinese government advisers and academics who called for the Thais to act decisively. “Don’t delay the project – now is the right time,” Professor Jingsong Song of Shanghai Jiao Tong University told the conference. The canal also received enthusiastic support from European business leaders. "We believe the project should have a very high priority for the government," Rolf-Dieter Daniel, president of the European Association for Business and Commerce, the umbrella group of European chambers of commerce in Thailand, told the conference. International experts believe there are no insurmountable technical obstacles. "If the right interest groups were aligned, could this get done? Of course," Jonathan Hillman, a global infrastructure expert and director of the Reconnecting Asia Project at the Washington-based Center for Strategic and International Studies, told me. "It could be a game-changer in the region, strategically and economically." Harald Wagner, a former World Bank consultant who has worked on canals in Europe and now teaches civil engineering at King Mongkut's Institute, offers a similar assessment. Unlike the Panama Canal, the Kra route would be at sea level and require no elaborate system of locks. According to Wagner, the construction and excavation involved would be no more difficult that building a major dam, such as the Tarbela Dam completed on the Indus River in Pakistan as long ago as 1976. "Technically, it is easy to solve," he told me. Nicholas Farrelly, a Southeast Asia expert at the Australian National University's Coral Bell School of Asia Pacific Affairs, is sceptical that Thailand has the capacity to strike a deal, raise the necessary capital and begin excavations in the near future. However, he does not rule out the possibility of the retired generals eventually winning their campaign, especially as the junta needs to boost the country's still-fragile economy. "These old warhorses are indicating to their protégés that this is something that needs putting on the agenda," Farrelly told me. "Although they are somewhat estranged from direct executive authority, they are serious players. At some stage, I think it is likely to happen." As well as using their clout within Bangkok's corridors of power, the canal's backers have also embarked on a highly-organized grass roots campaign to win support among Southern Thais. The canal would directly affect some 60,000 people in 90 villages and the Thai Canal Association has set up local committees along the proposed route to sign up supporters, spell out compensation proposals and explain the job opportunities a canal would create. To further encourage locals, the canal association has hired one of Thailand's top environmental experts, Chumphon Sukkasean, a former Asean wildlife protection chief, as a key adviser. Chumphon says the proposed western entrance to the canal had been moved slightly on the recommendation of residents so that approaching vessels would not sail close to coral formations and the habitat of endangered dugong sea mammals. 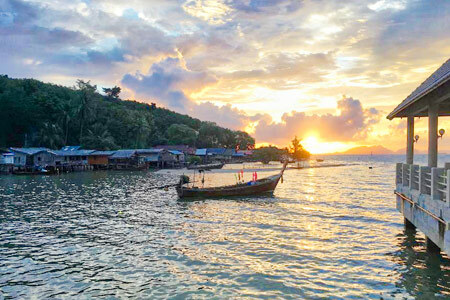 The canal's entrance would be at the estuary of the Galasai River, which forms the border between Krabi and Trang provinces on Thailand's Andaman Sea coast. Although within about 100km of the beaches, limestone karst formations and coral reefs that lure international tourists to Krabi, Phuket and the Phi-phi islands, this part of Thailand is underdeveloped. As it heads eastward, the canal route detours through a gap in the isthmus's hilly spine and bypasses the sensitive Thale Noi bird sanctuary wetland before exiting into the Gulf of Thailand on a lonely beach midway between the cities of Nakhon Si Thammarat and Songkhla. In these parts, many locals eke a living from fishing and farming, selling their produce at traditional floating markets, or work on rubber plantations. Annual family incomes can be as low as 50,000 baht (US$1,500), according to village leaders. Between 75 percent and 98 percent of the population of these communities want the canal's economic benefits, these local leaders told me. At Taborn, a district of 8,000 people straddling the canal's proposed eastern exit point, I joined villagers at their community hall, where they met to be blessed by saffron-robed Buddhist monks and discuss their future. Asked whether they supported the canal's construction, the audience responded with a sea of raised hands. "The people here aren't worried about the canal being built," district headman Pramot Saengarun, 63, told me later as he squatted under a shade tree. "What they are more worried about is that it won't happen." William Mellor has covered Asia Pacific business, finance and politics for more than 30 years as a correspondent for Bloomberg News, Time Magazine and specialist Asia-focused publications. During that time, he has interviewed prime ministers, presidents, hereditary rulers and many of the regionâ€™s most influential business leaders. You have 800 characters left for this comment. The Editors welcome thought-provoking comments, but racist, abusive, intolerant, hate language will not be carried on our pages. All feedback that adds to lively, constructive dialogue will be posted after vetting. Please enter this random text in the field below. Thailand should start with the KRA canal to support various industries along the new canal and improve their economy tremendously. Shipping companies will be eager to save cost. Life of the poor residents in the south could benefit from business generated from the usage of the KRA canal.As China/India and Middle east could tranship their products fast via Kra canal. Carving a canal through the Isthmus of Kra is a brilliant idea but could impact adversely on Singapore, which may find itself cut out of the equation. As the writer points out this does not actually lop off a huge amount of travelling distance or time but it does have great psychological impact for through-route shipping. this is good idea for south thailand and bring better opportunity for the people. An interesting project and certainly one worth considering if only to bypass pirate attacks in the Malacca Strait. I recall this has been on the cards for some time.